The River Church: "It is well with my soul"
The morning of September 12, at 1:38 a.m., we were woken up by our phones going off with a flash flood warning. Moments later my husband’s sister called saying that people were being evacuated. We live across the street from the St. Vrain River in Lyons, Colorado, near the corner of 4th and Evans. It had been raining for four days, and the ground was saturated. I grabbed some clothes for all of us — me, my husband, and my two boys, ages 6 and 9 — and threw them in bags. Then I started to grab some food. The air raid sirens started going off, and my husband went outside to check the river. He immediately came back inside and said that there was at least six inches of water in our front yard, and we needed to go NOW! We woke up our friends who live in a small cabin in our yard, and I threw the bags in the car. Then we woke up our boys and told them we needed to go to the car. I tried to remain calm, telling them, “It’s ok, it’s ok. We just need to go now.” We wrapped them in their blankets in only PJ’s, no shoes, and put them and our dog in my husband’s car. It was total chaos, completely dark, rain pouring down, water where it is not supposed to be and air raid sirens blaring. The hardest thing I have ever had to do was get in my car alone and drive without my family. I followed them through the water across the bridge and left my car at my mother-in-law’s house a block away, which was on slightly higher ground. On the way I called my mom and asked her to pray. I got in with my family and we drove through a river of water on Highway 36 to our shop where my husband has his business. My husband waded through three feet of water and miraculously got our motor home to start and drove it out of the water. He drove it up to the top of the Stone Canyon subdivision above our shop and left us there. He then went back to try to save what he could at our shop. As I waited there, I asked the angels to stand shoulder to shoulder, surrounding my house and hold it up. I remembered what a speaker had said just few days earlier at a Women of Faith Conference that my mother and I and a friend had attended. She said, “Worship God and He will draw near to you.” I prayed and started to worship God. As I sat there, with the rain pouring down, I praised God over and over. I sang every worship song I could think of. As I did this, a calm and peace came over me that I have never experienced. The boys fell asleep and we waited there through the night. When the sun came up it was hard to see anything. I got on Facebook to see what people were saying and asked local people if they could see my house. 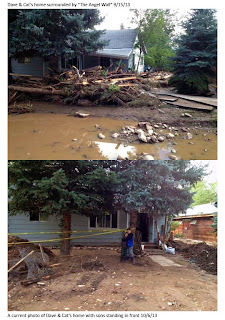 Kim, our Pastor’s wife, answered that our area was flooded:(, I was happy for any information. My boys woke up, and, to pass the time we sang, You are my Sunshine, Let the Sunshine In and The Sesame Street Theme Song (“Sunny days, taking my cares away…”) A friend that lives in Stone Canyon called to see if we were ok and brought us toys and shoes for the boys and food — what a blessing! Later in the day, when it quit raining, we were able to drive up to the top of the mountain overlooking Lyons. All we could see was a town divided by rivers into five islands and areas under water. Another friend in Stone Canyon told us to come and plug our motor home in at her house. What a blessing to have friends like that. There were tons of kids there and the boys made new friends and had a great time. Every day we have had huge blessings like that from God. Friends and family helping us, bringing us food and supplies, helping with my kids and bringing a backhoe for my husband to use almost immediately to help the community as soon as the waters receded. There are too many blessings to count. 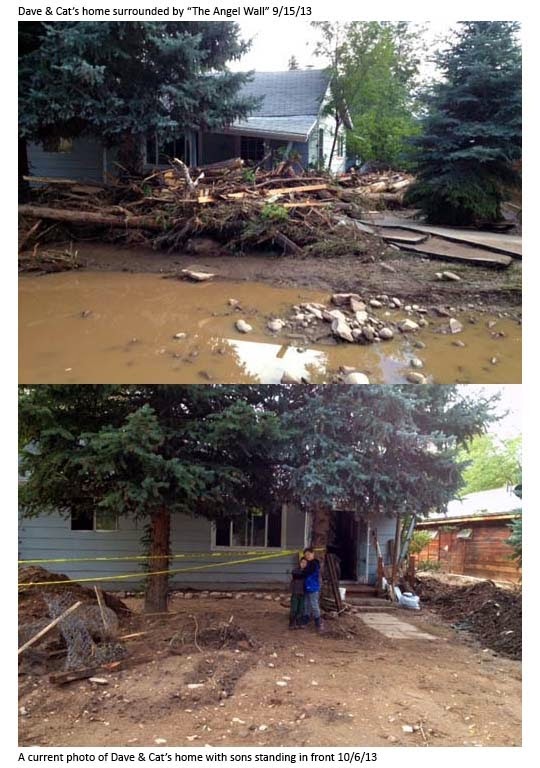 As we watched from the other side of the river, our house sat in the raging water for two days. When the waters finally receded, we were able to hike in to get a few precious things. God gave me a song of comfort, as I went into my house for the first time, I sang (ironically) ”I am going to the River” and it helped me do what I needed to do. When I was able to get to the front of my house, I saw the most incredible sight I have ever seen. There, wrapping from the middle of the front of my house all the way around it to the side middle corner, was the most amazing debris wall I have ever seen! The wall the angels built. MY angel wall! It kept the water from slamming the house and diverted it between the houses and down the street. It was beautiful. My angels are so awesome! God gave me physical strength over the next few days to rip all the wet, mud-soaked carpet out of the house, throw out tons of flood-soaked stuff that was in our house into an enormous pile and pack everything savable into a truck. This is not something I could ever do alone. I am not that strong. Jesus was walking with me. He kept me calm through it all. An incredible team from disaster relief came and gutted my house of drywall and floors, they were an absolute God send! Every day I sang worship songs and praised God. It kept me calm and strong, even through countless hours of insurance adjustors, FEMA and more insurance companies. The flood was three weeks ago. God has given me a tremendous peace about all of this. Our house and property is a mess, but I see it now as a blessing in disguise and a new beginning. We don’t know what it will take to repair our house or when we will be back in our home, but I know that God is in control and He will provide. We are all ok and that is only stuff. I no longer see any of the yuck around. I see many blessings, too many to count, that have come from this, and keep coming every single day. I see our family strengthened by this. I see so many incredible people who are willing to give of themselves, and I see my sons learning that God is good and so are people. I have told so many people what God has done for us, I only hope they will see it too. Amazingly, this is not something that God is letting me to be sad about! Our community may be changed but it is not gone. This will only strengthen us. Worship God and He will draw near to you. Praise Him. This is a new beginning! It is well with my soul.